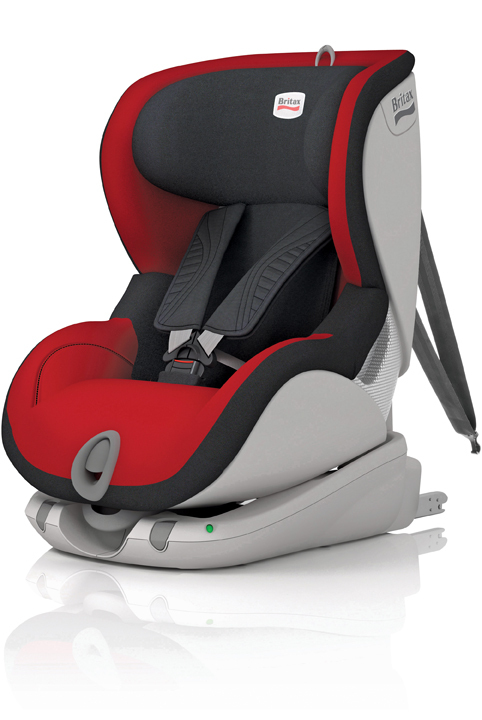 The Britax Trifix has been hailed as ‘The Safest Forward Facing Car Seat Yet’. With impressive specifications we put the Trifix to the test and were delighted with the results. Each parent will be aware how important it is to ensure you buy the right type of car seat for your child and that it is fitted correctly. Only 30% of child car seats are installed correctly when using an adult seat belt compared to 96% when using the ISOFIX system. The Trifix has been tested to the highest standards and is easy to fit in the car as it has ISOFIX+ which means you can connect it directly to the car’s ISOFIX and Top Tether anchorage points. A simple release at the back of the car seat releases the ISOFIX hooks. With simple guidance they then lock onto the ISOFIX points located in the seat of the car. This was very simple to do and once it is locked in, both indicators at the front of the seat turn green. We found this really reassuring and even when we tried to move the seat, found that it was securely locked in. To release the seat, you simply press the release buttons at the front. Again, this is very straight forward and you could easily transfer the seat from one car to another. It is not particularly heavy but Britax have still built in two points in the arm rests so that it is easy to pick up and move. We were initially concerned about how Eva would settle into her new seat as her previous one had been rear facing. We could immediately see the difference in her face and the 5 point harness secured her safely into the seat. Most children fall asleep in their seats during driving and Eva is no exception. There is a release underneath the front of the seat which is easy to locate and it simply reclines the seat back. We did this with ease and without waking her. The seat has deeply, softly padded side wings which provide optimum side impact protection and comfort. The performance chest pads reduce a child’s forward movement and we felt Eva slept comfortably and happily as we drove along without her head hanging over the side or front of the seat. The cover is easily removable for washing which is a great added feature and when not in use, the carseat is easy to store. We were really impressed with how easy the manual was to follow and the actual ease of use overall. The Trifix is a top of the range car seat. From 9 months+ it will last your child all the way up until 4 years of age. Proving to be great value for money. The ISOFIX+ capabilities are amazing and you can rest assured that your child is safe and secure whilst you are driving. It is impressive how well designed and made the Trifix is and Britax are certainly leaps ahead with their latest addition to the market.